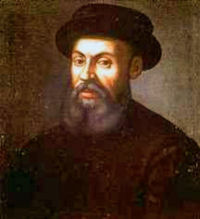 Ferdinand Magellan was born in 1480 to a noble family in Sabrosa, Portugal. For the first thirty-nine years of his life, Magellan had a very adventurous life. First he sailed with Francisco De Almeida to India, then he served for ten years in the Portuguese army fighting seven years to secure trade in India, and then he fought against the Moors in northern Africa for three years. During these ten years he received wounds that left him partially lame for life. The Portuguese king Manuel refused to raise his pension and dismissed him from his service. This enraged Magellan so much that he went and offered his service to Charles, the king of Spain. Magellan was one of the people who believed that there was a passage through the Americas that would enable ships to find a much faster way to the Indies. He and his partner Ruy Faleiro convinced the King of Spain that because of the Treaty of Tordesillas, the Spice Islands were under Spanish dominion. Charles agreed to give Magellan Five ships for his quest: the Trinidad, the Victoria, the San Antonio, the Concepcion, and the Santiago. Magellan then crossed the Atlantic and landed on the coast of Brazil. After sailing up and down the coast for a several months, Magellan’s fleet was forced to stop and winter in Patagonia. During the winter one of the ships was destroyed in a violent storm and a group of men mutinied, but when spring came Magellan was ready to sail. Finally Magellan found a strait at 49.5 degrees south latitude. One of the ships mutinied rather than face the perils of navigating the strait, but the remaining three ships made it through safely. (These straits are now called “The Straits of Magellan”) In March 1521, after a long and difficult Pacific crossing, Magellan reached Guam. He had accomplished his goal of sailing to the Spice Islands by sailing west. Magellan was killed in a skirmish with some natives when he was in the Philippines. This left one of the ships without an adequate crew, so it was burned. This left the Trinidad and the Victoria loaded with cloves, and on their way home. After sailing for some weeks, the Trinidad sprung a leak, and the Victoria left for Spain without her. The Trinidad was captured by a Portuguese ship, and only four of her crew ever returned to Spain. When the Victoria came back to Spain, her battered and bruised crew were heroes. They had done what no other group of men had ever done before, and circumnavigated the globe. This page was last modified on 1 October 2018, at 23:39. This page has been accessed 14,334 times.